The bouzouki (/buːˈzuːki/; also buzuki; Greek: μπουζούκι, pronounced [buˈzuci]; plural bouzoukia Greek: μπουζούκια) is a musical instrument popular in Greece that was brought there in the 1900s by Greek immigrants from Turkey, and quickly became the central instrument to the rebetiko genre and its music branches. A mainstay of modern Greek music, the bouzouki has a flat front, usually heavily inlaid with mother-of-pearl. The instrument is played with a plectrum and has a sharp metallic sound, reminiscent of a mandolin but pitched lower. There are two main types of bouzouki: the trichordo (three-course) has three pairs of strings (known as courses) and the tetrachordo (four-course) has four pairs of strings. The name bouzouki comes from the Turkish word bozuk, meaning "broken" or "modified", and comes from a particular re-entrant tuning called bozuk düzen, which was commonly used on its Turkish counterpart, the saz-bozuk. It is in the same instrumental family as the mandolin and the lute. Originally the body was carved from a solid block of wood, similar to the saz, but upon its arrival in Greece in the early 1910s it was modified by the addition of a staved back borrowed from the Neapolitan mandola, and the top angled in the manner of a Neapolitan mandolins so as to increase the strength of the body to withstand thicker steel strings. The type of the instrument used in Rembetika music was a three-stringed instrument, but in the 1950s a four-string variety by Manolis Chiotis was introduced. From a construction point of view, the bouzouki can have differences not only in the number of strings but also in other features, e.g. neck length, width, height, depth of the bowl or main body, the width of the staves (the wooden gores or slices of the bowl) etc. These differences are determined by the manufacturer, who in his experience and according to the sound that the instrument should make, modifies his functional elements to achieve a more piercing, deeper or heavier sound. The size and type of the resonating body largely determine the instrument's timbre, while the length of the neck, and by extension the strings, determines the instrument's pitch range, as well as influencing the timbre. While neck length can vary from instrument to instrument, most bouzoukis have the same number of frets, spaced such as to provide a chromatic scale in 12-tone equal temperament. On modern instruments the frets are metal, and set into fixed position in the fingerboard (in contrast to early instruments and the related baglama, in which frets were of gut or cord tied onto the neck, and moveable.) The quality of the wood from which the instrument is made is of great importance to the sound. For the construction of the bowl, mulberry, apricot, cherry, acacia, and elm are considered to be the best woods with walnut, plane, and chestnut being slightly inferior. The wood must be solid and sourced from slow growth trees. The top or soundboard should be cedar or spruce (preferably spruce) if possible, cut in one piece. The top plays a major role in the sound because it resonates and strengthens and prolongs the vibration of the strings. Another factor that affects the quality of the sound is the varnish and the method of its application. The best varnish is a natural one made of shellac, which is applied by hand in many layers in the traditional way, for both acoustic and visual effect. The neck must be of very dry hardwood in order not to warp and increase the distance of the strings from the fret board (the action height) which makes playing the instrument more laborious. To achieve this, manufacturers use different techniques, each one having their own secrets. Many modern instrument have a metal rod or bar (truss-rod) set into a channel in the neck, under the fingerboard, which adds some weight, but increases rigidity, and allows adjustment of the neck should it begin to warp. The Greek bouzouki is a plucked musical instrument of the lute family, called the thabouras or tambouras family. The tambouras has existed in ancient Greece as pandoura, and can be found in various sizes, shapes, depths of body, lengths of neck and number of strings. The bouzouki and the baglamas are the direct descendants. The Greek marble relief, known as the Mantineia Base (now exhibited at the National Archaeological Museum of Athens), dating from 330–320 BC, shows a muse playing a variant of the pandoura. From Byzantine times it was called pandura and then tambouras. On display in the National Historical Museum of Greece is the tambouras of a hero of the Greek revolution of 1821, General Makriyiannis. Other sizes have appeared and include the Greek instrument tzouras, an instrument smaller in size than standard bouzouki. The bouzouki arrived in Greece following the 1919–1922 war in Asia Minor and the subsequent exchange of populations between Greece and Turkey when the ethnic Greeks fled to Greece. The early bouzoukia were mostly three-string (trichordo), with three courses (six strings in three pairs) and were tuned in different ways, as to the scale one wanted to play. At the end of the 1950s, four-course (tetrachordo) bouzoukia started to gain popularity. The four-course bouzouki was made popular by Manolis Chiotis, who also used a tuning akin to standard guitar tuning, which made it easier for guitarists to play bouzouki, even as it angered purists. However it allowed for greater virtuosity and helped elevate the bouzouki into a truly popular instrument capable of a wide range of musical expression. Recently the three-course bouzouki has gained in popularity. The first recording with the 4-course instrument was made in 1956. The Irish bouzouki, with four courses, a flatter back, and differently tuned from the Greek bouzouki, is a more recent development, stemming from the introduction of the Greek instrument into Irish music by Johnny Moynihan around 1965, and its subsequent adoption by Andy Irvine, Alec Finn, Dónal Lunny, and many others. A close up of the headstock of a trichordo bouzouki. Two of these eight tuners are not strung. This is the classic style of bouzouki, introduced around 1900, that was the mainstay of most Rebetiko music. It has fixed frets and 6 strings in three pairs. In the lower-pitched (bass) course, the pair consists of a thick wound string and a thin string, tuned an octave apart. The conventional modern tuning of the trichordo bouzouki is D3D4–A3A3–D4D4. This tuning was called the "European tuning" by Markos Vamvakaris, who mentioned (but failed to describe) several other tunings, or douzenia, in his autobiography. The illustrated bouzouki was made by Karolos Tsakirian of Athens, and is a replica of a trichordo bouzouki made by his grandfather for Markos Vamvakaris. The absence of the heavy mother-of-pearl ornamentation often seen on modern bouzoukia is typical of bouzoukia of the period. It has tuners for eight strings, but has only six strings, the neck being too narrow for eight. The luthiers of the time often used sets of four tuners on trichordo instruments, as these were more easily available, being also used on mandolins. This type of bouzouki has 8 metal strings, which are arranged in 4 pairs, known as courses, typically tuned C3C4–F3F4–A3A3–D4D4 (i.e., one whole step below the four high strings of a guitar). In the two higher-pitched (treble) courses, the two strings of the pair are tuned to the same note. In the two lower-pitched (bass) courses, the pair consists of a thick wound string and a thin string tuned an octave apart. On the bouzouki the lower-pitched string comes first in these courses, the reverse of most other instruments with octave-paired courses (such as the 12-string guitar, charango or bajo sexto). These 'octave strings' add to the fullness of the sound and are used in chords and bass drones (continuous low notes that are played throughout the music). The guitar-like tuning was introduced by composer and soloist Manolis Hiotis, who found it better suited to the kind of virtuoso playing he was famous for. 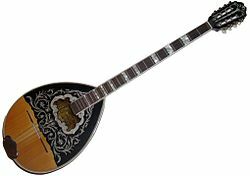 Today, the tetrachordo is the most common bouzouki used in Greek music, though a few traditionalists still prefer the trichordo, particularly for the older rebetika style of playing. In addition to developing the modern tetrachordo bouzouki, Manolis Hiotis was a pioneer the use of amplification for the instrument, which he may have been using as early as 1945. However, the earliest documented use of amplification for the bouzouki comes from a 1952 photograph, showing Vasilis Tsitsanis and Yiannis Papaioannou playing bouzoukis, each with an electric guitar-style pick-up attached in the soundhole. There are also numerous photographs between 1953 and 1959 showing bands in which both vocalists and bouzouki players are using microphones for amplification. By 1960 special bouzouki pickups (such as the German "Ideal") were being produced and permanently mounted in the instruments. Similar pickups are widely used by several Greek artists today and come in active and passive versions. The Greek baglamas (Greek: μπαγλαμάς) or baglamadaki (Greek: μπαγλαμαδάκι) is very different from the Turkish bağlama. The treble baglamas is pitched an octave higher (nominally D–A–D), with unison pairs on the four highest strings and an octave pair on the lower D. Musically, the baglamas is most often found supporting the bouzouki in the Piraeus style of rebetika. Richards, Tobe A. (2007). The Greek Bouzouki Chord Bible: CFAD Standard Tuning 1,728 Chords. United Kingdom: Cabot Books. ISBN 978-0-9553944-8-5. Stathakopoulos, Dimitrios (2014). Brief History of Bouzouki Instrument in Greek Language (Greek ed.). New York: Seaburn Books. ISBN 1592325173. Vamvakaris, Markos (2015). Markos Vamvakaris: The Man and the Bouzouki. greeklines.com. ISBN 0993263305. ^ "bouzouki". Collins English Dictionary. ^ "Bouzouki name origin". Archived from the original on 2012-02-09. Retrieved 2012-02-09. ^ Elizabeth Jeffreys, John Haldon, Robin Cormack, The Oxford Handbook of Byzantine Studies, Oxford University Press, 2008, p.928; confer also Nikos Maliaras, Byzantina mousika organa, EPN 1023, ISBN 978-960-7554-44-4 and Digenis Akritas, Escorial version, vv. 826–827, ed. and transl. Elizabeth Jeffrey. ^ Shorelis, Tasos; "Rebetiki anthologia"; Athens: Plethron; 1981:4, pp. 179–180. ^ a b Petropoulos, Ilias; Rebetika tragoudia, 2nd ed. ; Athens: Kedros, 1979. p. 488.